Fish are cold blooded animals. During warm and sunny weather they are very active and respond to feeding very fast. But when the weather is cold and gloomy, the response is slow. Fish don’t feed well when they are under stress. The stress may be caused by predator disturbance, sampling (by running a net through the pond), poor water quality etc. High water temperatures will also stress the fish because this reduces the amount of dissolved oxygen in the water. 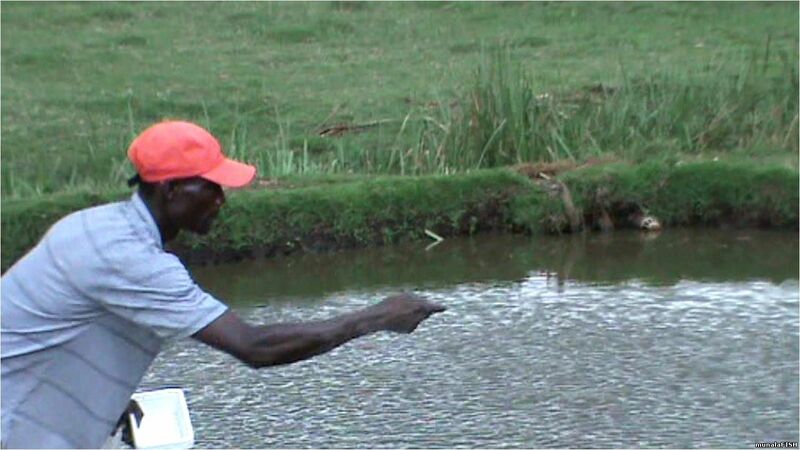 Tilapia are usually fed by broadcasting the feeds on the surface of the pond. They can either be fed from specific feeding areas or at various spots around the pond. The advantage of selecting specific feeding spots is that the fish soon identify such points with food and will respond very fast. Generally, one feeding point will work well for small ponds; but for bigger ones, several spots may be identified. As a rule of thumb, fish grown under semi-intensive culture should be fed at least twice a day. The best time to feed is in the mid-morning (between 9:00am - 10:00am) and mid-afternoon (4:00pm - 5:00pm). Fingerlings should be fed more frequently, but in smaller rations. Fish can either be fed on the basis of their body weight or on demand (ad libitum). 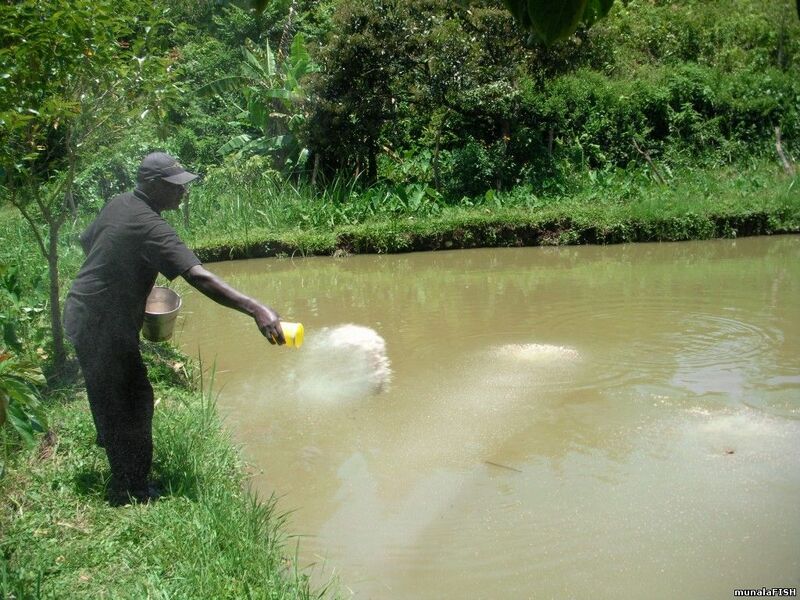 The fish are given feed equivalent to 3% - 5% of their body weight daily. Fish are fed based on their appetite. The person feeding needs to feed the fish for as long as they are actively feeding. Once the response has slowed down considerably and most of the feed remains floating, feeding can be stopped. THIS MUST BE DONE WITHIN A MAXIMUM OF 30 MINUTES - going beyond this time limit will lead to wastage since there is no time you will have 'zero response'.